I have long been an advocate of the importance of collaboration to deliver meaningful impact for communities and I have come back from #LondonatMipim even more enthused and excited about the value and ‘power of partnership working’ where, like place making, so much more can be achieved than working in silos. I was proud to be asked to provide place marketing and stakeholder engagement support to West London Business (WLB) & Old Oak and Park Royal Development Corporation(OPDC) for #MIPIM2018. Industry leaders, Liz Peace CBE, Chairman, and Victoria Hills, Chief Executive of OPDC and their colleague Patora Dyrma, Head of Communications & Engagement worked hand in hand with the passionate ‘West London’ advocate, Andrew Dakers, CEO of West London Business to co-host and promote the plethora of reasons why West London is a destination of choice for so many. The two host organisations brought together partners including AECOM, Fairvew New Homes, L&Q, Kier Group, SEGRO Plc, CoStar Group and my own company Sharp Business Insights. The week started with a welcome dinner attended by over 30 enthusiastic industry leaders with a common interest in the Old Oak opportunity area and West London, followed by an afternoon of debates on the New London Architecture (NLA) curated London stage dedicated to West London, with the OPDC, Hounslow, Ealing and Harrow Councils all outlining their vision for different areas of the sub-region. During the week the hosts curated two on the stand presentations and debates where they came together to promote the strength of the sub-region and discuss some of the challenges ahead in realising the opportunities. 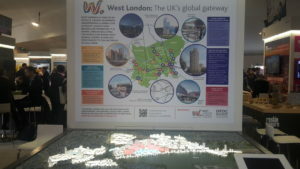 A plethora of events, meetings, fortuitous encounters within and outside the conference perimeter, and numerous successful discussions around the West London Business & OPDC stand took place – and the CoStar Group launched their market analysis of the office and industrial market in West London*. Liz Peace set out her vision for the UK’s largest regeneration site over the next decade, and beyond – And why she wholeheartedly believes that the sub-region will become London’s gateway to the rest of the UK. She discussed the new HS2/Elizabeth Line (Crossrail) Superhub Station, which will open at the heart of Old Oak Common in 2026 and West London’s wider road, rail, air and underground connections. This is why global and SME businesses are choosing the region as their home, and West London’s economy is ranked second in the UK behind London’s Central Activities Zone. Andrew Jones from AECOM explained the early master-planning work they have undertaken for the OPDC and the rationale behind the three strands: early activation, being prepared to unlock homes, and delivering the long-term ambitions for this new place. The Opportunity Area is ten minutes from the West End, close to Heathrow Airport and will be only 38 minutes to Birmingham once the Elizabeth (Crossrail) Lines are active. When complete there will be 25,500 new homes and 65,000 new jobs created. It is little wonder so many delegates were keen to understand how they could contribute to the future of this place. In summing up their week, the survivors concluded that there was a noted increased optimism amongst attendees and exhibitors at #MIPIM2018 compared with last year. Many noted the opportunity and need for deeper collaboration in promoting the UK as a whole, as well as the regional and sub-regional in future years at #MIPIM. So, that’s one of my main takeaways from #MIPIM. The power of partnership for #connecting #people and #connecting #places. 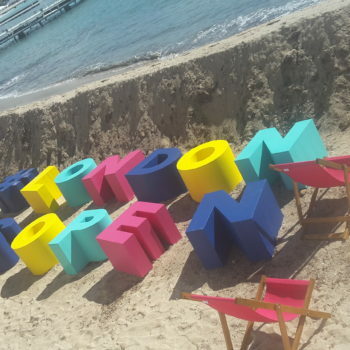 The #magicofmipim indeed! So a big thank you and well done to all who got involved in championing West London: Old Oak and Park Royal Development Corporation, West London Business, AECOM, Fairvew New Homes, L&Q, Kier Group, SEGRO Plc, CoStar Group and the many delegates that championed the sub-region, attended the events and the stand and who deliver great work that benefit this fantastic place. 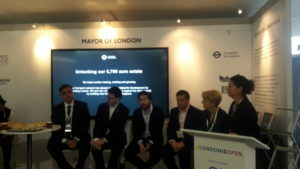 See you at future West London events or indeed, at #MIPIM2019!